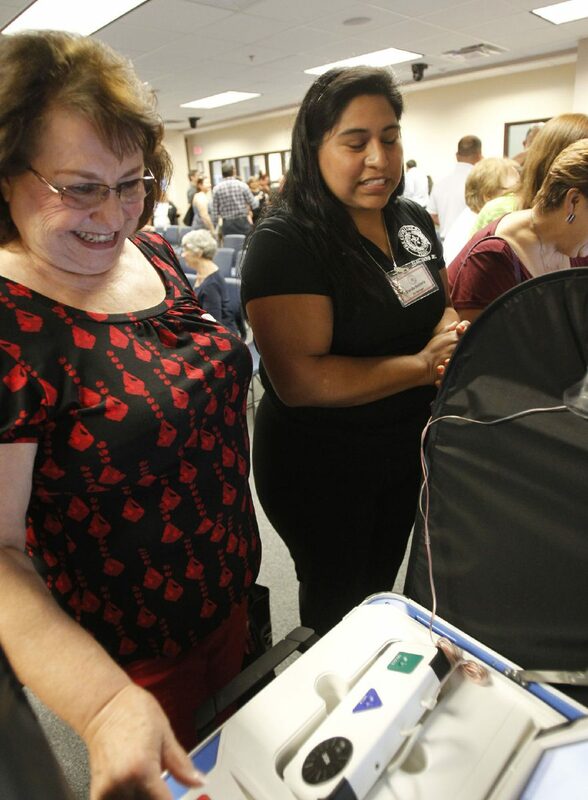 Folks gather for the unveiling of the New Hart Verify Touch voting machines during a press conference at the Hidalgo County Commissioners Court Wednesday June 28,2017 in Edinburg. EDINBURG — Election officials unveiled the county’s new voting machines that residents will use in the upcoming November election. Over 130 people became familiar with the new technology Wednesday, when the county kicked off the first of several planned open houses. Residents check out the new Hart Verify Touch voting machines Wednesday June 28, 2017 in Edinburg. Emma Morales of Alamo tries her hand at the new voting machines at the Hidalgo County Commissioners courtroom Wednesday June 28, 2017 in Edinburg. Wednesday’s event in the commissioner’s court chambers was the culmination of a long and winding search for new machines. “We embarked on a really big endeavor,” Salinas said. And like with most endeavors — there were hiccups along the way. Perhaps the biggest one came earlier this year, when county commissioners found out the county had all but paid for the machines before their final approval. The confusion stemmed from a resolution they had previously signed basically stating the county would purchase the machines if the supplier, Hart Intercivic, was certified by the state. The resolution went a long way, and commissioners appeared forced to finalize the $5.4 million purchase when they found out the machines had already been shipped. 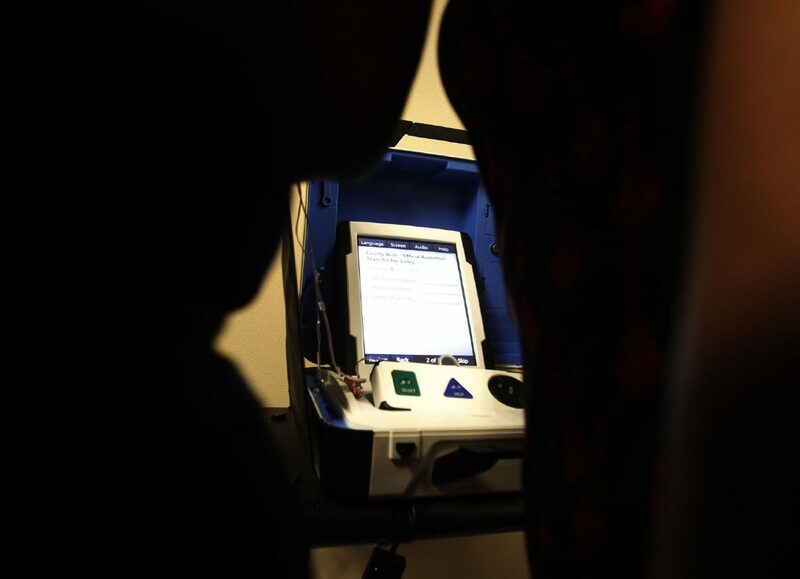 The new machines, however, offer plenty of benefits, including the ability to perform audit reports, officials said, assuring they were also more secure than paper ballots, of which critics argued the opposite. 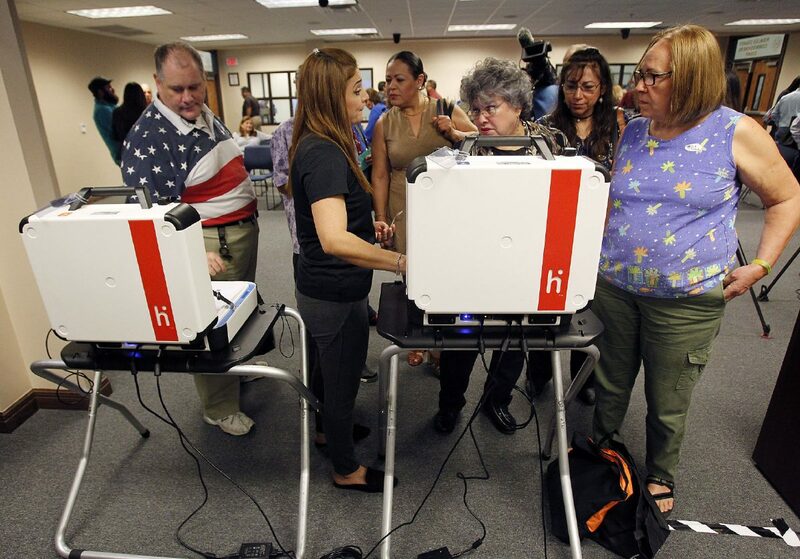 For years there’s been a long-running — albeit unsubstantiated — suspicion in Hidalgo County that the previous voting machines could easily be tampered with. And in 2014, the allegations culminated in a grand jury investigation. Chicago-based Data Defenders, a firm specializing in computer forensics, was hired to examine the previous voting machines for possible tampering. The firm’s experts, however, found no evidence of foul play. Salinas said the new machines can’t be hacked because they are not connected to a network. The news comes amid a frenzy of reports about Russia and the Kremlin’s purported attempt to meddle in U.S. elections last November. She compared the technology to a simple, hand-held calculator, with no potential of being hacked. “And we’re also an offline county,” she added. Elections staff will soon begin training election judges, clerks and others on the new machines, with more open houses scheduled to continue for the general public, though no dates have yet to be set. 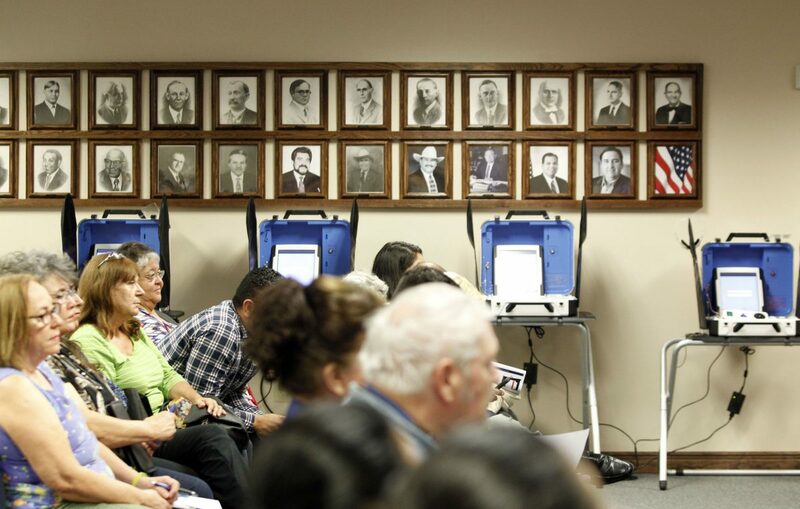 This story has been updated to reflect Hidalgo County commissioners had the final say in purchasing the voting machines and Elections Analyst Hilda Salinas made her assertions based on media reports.